SOCIALLY: A sense of unity is built with local character; an empowered comaraderie forms. ECONOMICALLY: Locally owned businesses recycle a much larger share of their revenue back into the local economy, enriching the whole community. We believe that as a local business ourselves, we should support other local businesses and organizations as well. Together, we make a difference. 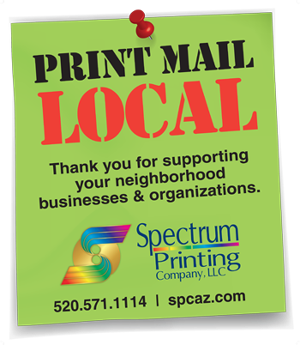 Thank you for choosing to support your local printer and mailer right here in Southern Arizona.